Has passed the European Suspension Test BS EN 1276 / European Standard EN 13697 and is effective against pseudomonas aeruginosa, escherichia coli, staphylococcus aureus and enterococcus hirae after a contact time of 5 minutes- 75ppm solution, 10 minutes - 50ppm solution and 15 minutes - 25ppm solution. 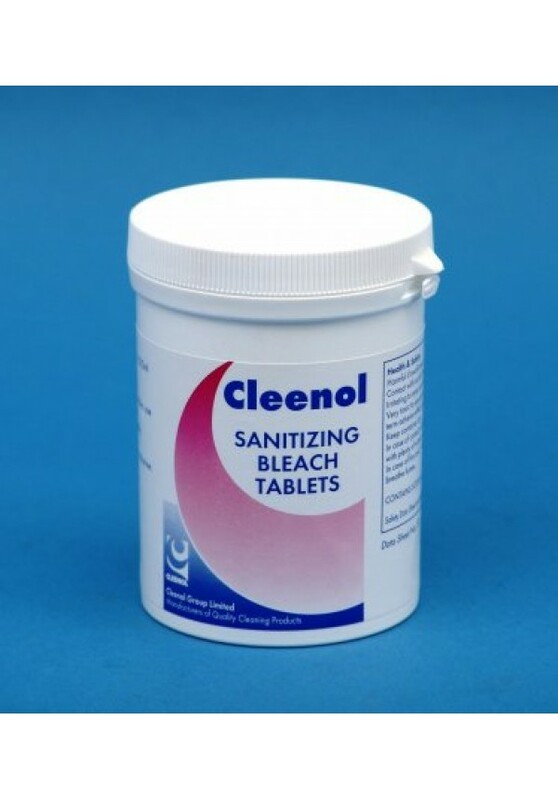 Chlorine bleach based disinfectant tablets. Dissolves to give a solution of ready to use bleach. The active constituent is dichloroiscyanurate. Each tablet yields 220 parts per million of available chlorine when placed in 500ml of cold water. Ensure surfaces are clean. Dissolve 1 tablet in 500ml cold water to give a working concentration of 220 parts per million of chlorine. Spray, rinse or wash the clean surfaces by the most appropriate means. Do not allow solution to fall below 20ppm available chlorine, either by regularly replacing with fresh solution every 3-4 hours or by testing the chlorine levels regularly. Remove as much dirt and debris from the vegetables and fruit as possible by thoroughly rinsing in cold fresh drinking water. Prepare the above solution by adding the appropriate quantity of tablets to the recommended volume of water to give the required amount of free available chlorine in solution according to the recommended contact time. Potable tap water from the mains supply is satisfactory. Add the vegetables or fruit to the solution for the recommended contact time. Ensure produce is completely submerged. Agitate produce to remove excess air bubbles. Fruit or vegetables should be eaten as soon as possible after washing.